PCD Pharma Franchise in Mumbai – Starting your own business in the pharmaceuticals sector is a good way of securing a better future. Biofield Pharma’ top Pharma Franchise Company in India brings you some of the widest variety of medicines in India. We offer 300+ range of medicines from different markets like ortho medicines, general medicines, gynecology medicines, pediatric range etc. You will be offered genuine business opportunities with good growth support. We offer PCD pharma franchise in Mumbai to different locations for serious and hardworking people on a monopoly basis. The business capital of India has a lot to offer when it comes to starting or expanding the business. The pharmaceuticals industry is currently the most profitable place where you can invest in better returns. Biofield Pharma is the best for PCD pharma franchise in Mumbai. Our company brings you genuine business dealerships across Mumbai (Maharashtra). We will provide you with GMP & WHO certified products that are made under the supervision of skilled experts. You can trust our company for better solutions and genuine business scope in the market. 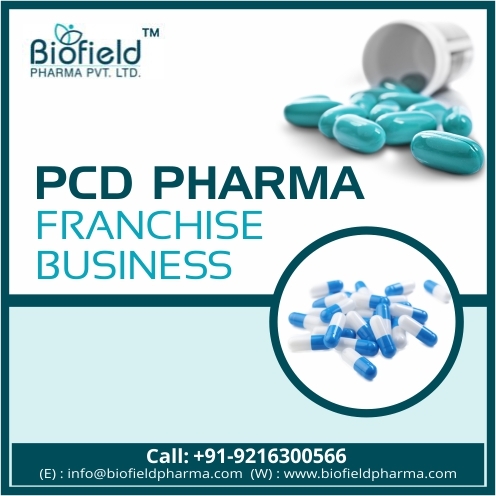 You can get more information related to our PCD franchise business by sending an email at info@biofieldpharma.com or drop a message via contact inquiry form. If you want, you can call us at +91-9216300566 or +91-9216300166 or go for live chat option. We promise to deliver you high-quality products at most reasonable rates and other benefits. Certified with ISO 9001:2018, we have come a long way of achieving great success and popularity across India. Maharashtra has been a good business destination for pharma franchise. We are currently looking for pharma franchise business vendors in Mumbai. We service high-quality drug formulations that are developed and manufactured under the guidance of experts who have years of experience in the sector. Professional care and better services have been the aim of our company. We frequently work on our goals of improving customer satisfaction. Biofield Pharma is one of the top pharma PCD franchise company that is providing the best services in all the locations of Mumbai. Our company has always maintained high standards when delivery custom-made solutions to customers across India. We have been professional in our work and keep on motivating with better skills, methods, and techniques to deliver higher self. The constant goal has been to bring superior drug solutions by improving our set of manufacturing facilities and measurements being followed in order to attain the best. Start Your Own Pharma Franchise Business in Mumbai! Mumbai Suburban: Franchise PCD Pharma in Andheri, Kurla, and Borivali. What is the Scope of Pharma PCD Franchise Business Near You? Specialty PCD Franchise owners etc. High-Quality Range of Pharmaceuticals Medicines For Pharma Franchise! Biofield Pharma brings you more than 300+ drug solutions covering Tablets, Capsules, Powder, Drops, Ointment, Injectables, and Syrups etc. Our company brings you DCGI approved drugs from multiple segments. You will get quality drugs solutions of therapeutic segments like Antibiotics, Anti-inflammatory, anti-allergic, analgesics, anesthesia, anti-infective etc. You can take the PCD franchise in any of the drug market segment that concerns you. We at, Biofield Pharma assures you high-quality medicines will be offered for business purpose. Our company will be offering monopoly rights to all the dedicated locations where you will be appointed. The price of each medicine is quite genuine. You can earn a good income out of it. Our company offers good scope where you can grow your current business. The marketing tools provided by the company are offered free of cost. You will get an attractive incentive scheme and bonus prior to attaining sales target. Genuine sales targets are appointed. Long business deals are offered by the company. You are always welcomed to share your queries to start your business in Mumbai as a PCD Pharma Franchise distributor. We are a proud Mumbai-based Pharmaceuticals Company that always ensure the best for you.